The Siheyuan is a building complex formed by four houses around a quadrangular countyard. The siheyuan is a typical form of ancient Chinese architecture, especially in the north of China. They are designed to make it as comfortable as possible to live in a climate that is at times inhospitable. For instance, the Siheyuan are enclosed and inward facing to protect them from the harsh winter winds and the dust storms of spring. Their design also reflects the traditions of China, following the rules of Feng Shui and the patriarchal, Confucian tenants of order and hierarchy that were so important to society. Characters: Siheyuans are arranged in rows and vary in sizeand design according to the social status of the residents. The big Siheyuans of high-ranking officials and wealthy merchants were specially built with roof beams and pillars are beautifully carved and painted, each with a front yard and back yard. The specially built Siheyuans all face the south for get enough sunshine and resist cold wind from the north because the air-conditioning is our of the question in those houses at that time. Rooms: It is normal for the four rooms to be positioned along the north-south, east-west axes. The roompositioned to the north and facing the south is considered the main house and would traditionally have accommodated the head of the family. The rooms adjoining the main house are called “side houses" and were the quarters of the younger generations or less important members of the family. The room that faces north is known as the "opposite house" and would generally be where the servants lived or where the family would gather to relax, eat or study. Outsides of Siheyuan: The gate to the courtyard is usually at the southeastern corner. Normally, there is a screen-wall inside the gate so that outsiders cannot see directly into the courtyard and to protect the house from evil spirits. Outside the gate of some large Siheyuan, it is common to find a pair of stone lions. The gates are usually painted vermilion and have large copper door rings. All the rooms around the courtyard have large windows facing onto the yard and small windows high up on the back wall facing out onto the street. Some do not even have back windows. Some large compounds have two or more courtyards to house the extended families that were a mark of prosperity in ancient times. Cultural Background: Siheyuan is a mirror that reflects the history of Beijing. It still houses many of the city's residents within the second ring road, which marks the limits of old Beijing. However, many of the Siheyuan, which consist of four rooms around a central yard, are being torn down at present, and quite a large proportion of those who have enjoyed courtyard living for generations have now moved to high-rise blocks of flats in new residential areas. Tulou means 'earth building'. It is named from its outer walls, which are made from rammed earth. Generally speaking, the large multi-storey Tulou was seldom seen in the areas where early Hakka lived. However, they are appeared in the perimeters of Hakka and other ethnic groups or around locations where Hakka fast developed after Ming and Qing dynasties. 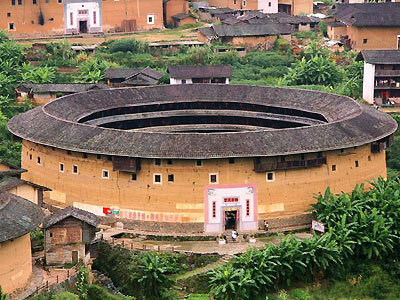 The Tulou in the Fujian Province is divided into three types,Wufeng, Rectangular, and Round. Wufeng are located mainly in Yongding, and rectangular and round Tulou are distributed in Nanjing , Pinghe, Zhaoan West and Yongding East. In most of the villages, round and rectangular tulous are mixed together. Among three kinds of Tulous, the rectangular Tulous were the original ones. Wufeng Tulou: The Wufeng tulous are obviously the results of a redesign of the Chinese courtyard by the Hakkas. 'Three halls and two side rooms' are a feature of the Wufeng tulou. The side rooms are the heightened wing-room of the Chinese courtyard. The center hall in the back yard becomes a multi-storey building. The earth walls in the four sides are enclosure. This was not only for defense reasons, but also as an expression of traditional Chinese architectural forms. 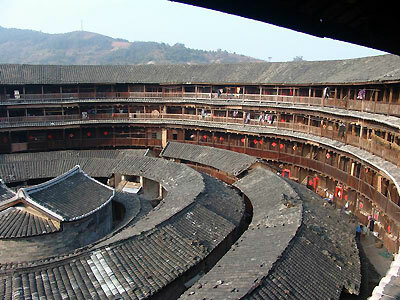 Rectangular Tulou: In reality, the rectangular Tulous were built earlier than round ones. For example, in the northern part of the Guzhu, Yongding, the rectangular tulou, named Wuyun Tulou was built five or six hundred years ago, while the round shape, Chengqi had only been built for three or four hundred years. Round Tulou: The round Tulou has distinct characteristics. It is high, giant, and complex. Generally speaking, round Tulous can be divided into small, medium, and large types. Small round tulous are normally two or three storeys and consist of a single ring; medium round tulous are three or four storeys high and have wide diameters or two rings; large ones are four or five storeys with two rings or even three rings. A large number of round tulous are of medium size. The Tulou is occupied normally by a kin group. As a result it is more like an apartment or a small village rather than a single building. Round Tulous normally have only one fortified door. Behind the door is the foyer. This is not only the major access, but also the public space for the occupants. The natural ventilation is ideal. No matter what size and how many storeys of round Tulous, the room sizes are the same at the same location on each floor. The ground floor is always the kitchen. 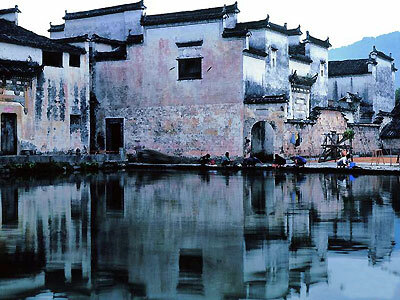 Xidi and Hongcun are two exceptionally well preserved traditional Chinese villages from the Ming and Qing Dynasties. Their townscapes are developed in harmony with the natural environment, using the geomantic principles of Feng Shui. Therefore, most ancient villages are set up against mountains and facing waters. This is believed to bring good luck to all villages. In fact, this brought about convenience both to living and to farming for the villages. Furthermore, the village is segmented by winding and narrow lanes. 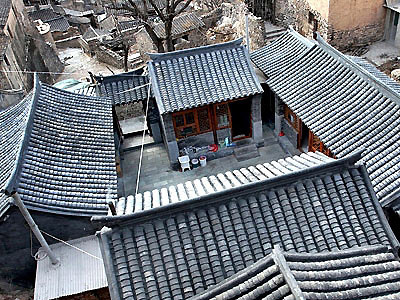 The Huizhou style is the predominant architecture in the villages: white walls, dark tiles, horse-head gables, stone drums or mirrors and open interior courtyards are common features. It was the style favored by the local merchant class. Reputed as "A Living Ancient Residential Museum" by experts and tourists at home and from abroad, they were listed as a world cultural heritage site by UNESCO in 2000.